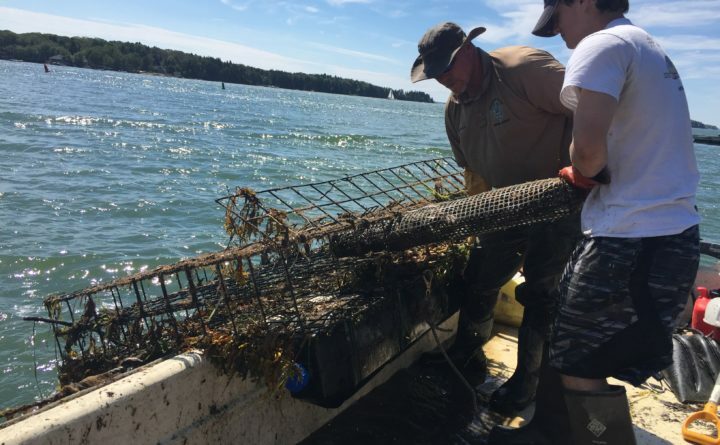 Brunswick Harbormaster Dan Devereaux pulls oyster cages out of Maquoit Bay in 2017. Claiming that it interferes with their ability to make a living, lobstermen and other industry advocates from across Maine are petitioning the state Department of Marine Resources to temporarily stop the issuance of coastal aquaculture licenses. “The existing aquaculture regulations allow private leases to be granted in any location, without regard to whether there is a better or more suitable location for aquaculture nearby that would cause fewer conflicts,” reads a 189-signature petition submitted to the department early Wednesday afternoon. “Slow the lease process down and protect our livelihood from what has become nothing more than an old-fashioned land grab in upper Casco Bay and Maquoit Bay,” he said during a news conference in the State House before the petition was filed. The petition calls for an immediate moratorium on all pending aquaculture lease applications for coastal areas larger than 10 acres. In total, there are nearly 50 aquaculture licenses currently pending state approval. If the department deems that at least 150 petition signatures are legitimate, it will trigger a formal process for the department to receive public testimony and consider the petition’s merits, DMR spokesperson Jeff Nichols said. Though fishermen and lobstermen from across Maine signed the petition, which proposes a statewide moratorium, a proposed oyster farm off Brunswick’s Mere Point peninsula in Maquoit Bay, was the tipping point for many. Petitioners on Wednesday asked that the location of this project, specifically, be retroactively halted and re-examined by the department. Brunswick Harbormaster Dan Devereaux, who is part of the team awaiting a 10-year aquaculture license for Mere Point Oyster Co., the 40-acre Maquoit Bay site in question, knows this, and he thinks the issue is bigger than licensing. “Ecology along the coast of Maine is changing whether we want to admit it or not, science points to the migration of lobsters to the northeast,” Devereaux said. Aquaculture will play a crucial part in the future of Maine’s fishery, and “slowly integrating this type of development along the coast is, in my opinion, why we did this,” Devereaux said. In the meantime, Scarborough resident, lobsterman and tuna fisherman Mike Breton, who hauls traps around Sturdivant Island off Falmouth, said aquaculture licenses are infringing on the water that’s been designated his by the state.